As sharing spreads, it’s guaranteed to disrupt virtually every industry and every job function. Businesses today need to understand the collaborative economy and all of the opportunities that it offers. Before now, there was very little data on how many people are participating in sharing services. Recently, Crowd Companies and Vision Critical teamed up to ask more than 90,000 people about their participation, motivations and experiences in the collaborative economy. In Sharing is the New Buying, they’ve translated their insights into crucial knowledge and recommendations for businesses. Four major findings from the new study can help companies develop winning business strategies in the collaborative economy. In today’s collaborative economy, there are three distinct groups of people: non-sharers, re-sharers and neo-sharers. Non-sharers are people who have yet to engage in the collaborative economy. Re-sharers buy or sell pre-owned goods using well-established services and solutions. Neo-sharers are using emerging services to share as part of a community. Together sharers — including re-sharers and neo-sharers — make up more than 40 percent of the population. The new study revealed that the collaborative economy is predicted to double this year. At least as many people intend to try sharing in the next 12 months as have tried it in the past 12 months. There will be an extreme increase in the demand for new business models of access over traditional models of ownership. Businesses will need to provide even more opportunities for rental, on-demand, subscription and try-and buy services. To harness this growth and meet the increasing demand for collaborative services, businesses need to understand which types of sharers and which types of sharing can facilitate a successful entrance into collaborative economy. Neo-sharing could double in the next 12 months. In all the neo-sharing categories, there are roughly equal numbers of recent and prospective users. Intent to try new forms of sharing is highest among neo-sharers. In most categories of sharing, 12-15 percent of neo-sharers who haven’t tried that type of sharing say they will in the next 12 months. Nearly every category of neo-sharing enjoys similar levels of interest from prospective users: 4-9 percent intend to try it in the next 12 months. This means that much of the growth of sharing will come from existing neo-sharers who are broadening the range of neo-sharing services they use. While the growth of the collaborative economy will be driven by the growth of neo-sharing services, re-sharing will be an important entry point for people who are not yet sharing. In the next 12 months, 14 percent of non-sharers intend to try a re-sharing site. The collaborative economy may be a movement, but that doesn’t mean all sharers are social activists. A powerful piece of the collaborative economy is that a lot of making and sharing is motivated by the same pragmatic considerations that drive conventional forms of consumption and production. For businesses that understand how to compete on price or quality, they can enter the collaborative economy with an advantage. Leading with taglines about sustainability or community may not be the most effective. Just one quarter of sharers reported sustainability as a reason for using a sharing service. Find innovative ways for your brand to communicate the cost and convenience benefits of on-demand access over traditional purchases. 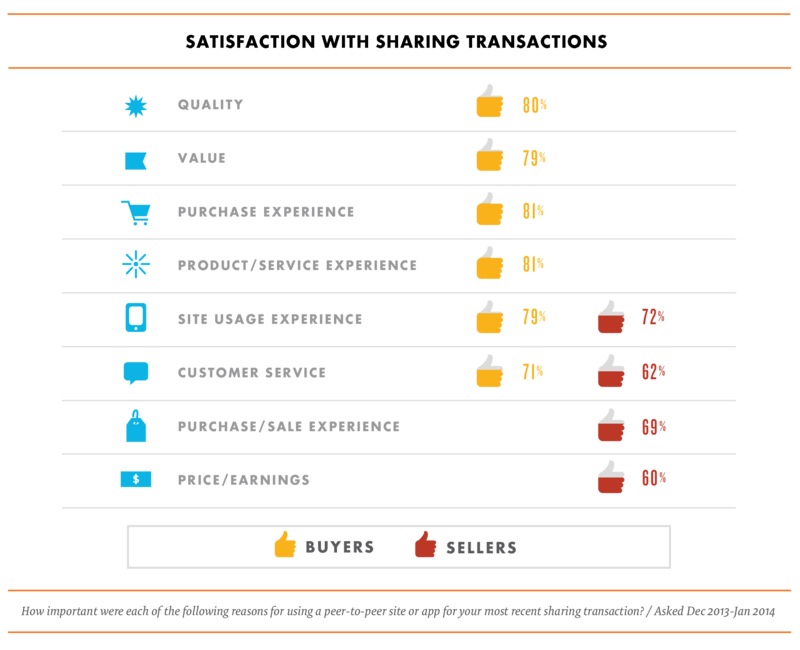 Marketers and brands must take note: convenience, value and quality are the actual drivers of sharing transactions. Businesses that know how to deliver a satisfying purchase experience driven by convenience, value or quality will not be far from offering a similarly satisfying sharing experience. But as brands enter the collaborative economy, be aware that the bar for sharing experience has been set very high. The extreme rate of customer satisfaction for consumers using sharing services must be noted. The study revealed that customers were overwhelmingly positive about their sharing experience. When asked about their latest sharing experience, more than 75 percent of buyers were “very” or “extremely” satisfied. Additionally, sellers and providers also are happy with their sharing experience. When asked about their latest sharing experience, 60-72 percent of sellers/providers were “very” or “extremely” satisfied. Most remarkable is the number of sharers who said they would re-use or recommend their most recent sharing experience. Nearly 65 percent of sharers said they would “definitely” recommend the service to someone else, and an additional 26 percent said they would “probably” recommend the service. Stunningly, 91 percent of sharers intend to engage in this type of sharing again in the next 12 months. Businesses entering the collaborative economy face massive opportunities and potential pitfalls. Today’s sharers have high expectations for sharing experiences through their relatively high satisfaction levels with current services. Customer satisfaction with sharing sites points to a larger intrinsic satisfaction of sharing services in general — if you can successfully deliver a sharing service to customers they may be predisposed to embrace it. On the other hand, the high ratings of existing services suggestion the urgency of getting into the market quickly before all those happy customers lock into exclusive brand loyalty with services they already use. Brands that successfully tap into the collaborative economy can win big. Customers who have a positive sharing experience are very likely to recommend the brand to their friends, frequently reaching the ultimate point in the dynamic customer journey — post-commerce advocacy. Businesses that embrace the opportunity to mobilize advocates and harness the power of word of mouth will win big in the collaborative economy. The societal, economic and technological shifts that have given way to the collaborative economy have caused major disruptions for traditional business models. As a result, companies must adapt and shift their business strategies to prepare for a new economy where people can get what they need from each other. Consider these strategies simply as a starting point and launching pad for developing your own new ways to reach customers in the collaborative economy. Offer “lifestyle as a service” to younger and more affluent markets. More likely to be neo-sharers, this segments seeks access to a life of luxury without the drawbacks of permanent ownership. Brands can offer access over ownership and provide exclusive goods and services on demand with the prestige of trying new items. Bring new marketplace business models to opportunity-rich urban areas. Urban areas are at the forefront of collaborative economy adoption because of the economies of scale and increased word-of-mouth recommendations that stem from such urban density. Brands can leverage this opportunity by sponsoring existing marketplaces and offering value-added services. This can be used as a stepping stone for brands to launch their own sharing services. Drive sharing with social media marketing. A very high percentage of sharers use social networking on a regular basis, and brands can use sharers’ propensity for social networking to ignite the cycle between high customer satisfaction and recommendations. Market the direct benefits of sharing services. Contrary to common discussions among startups and thought leaders, sustainability and community building are not see as the primary benefits of using sharing services. 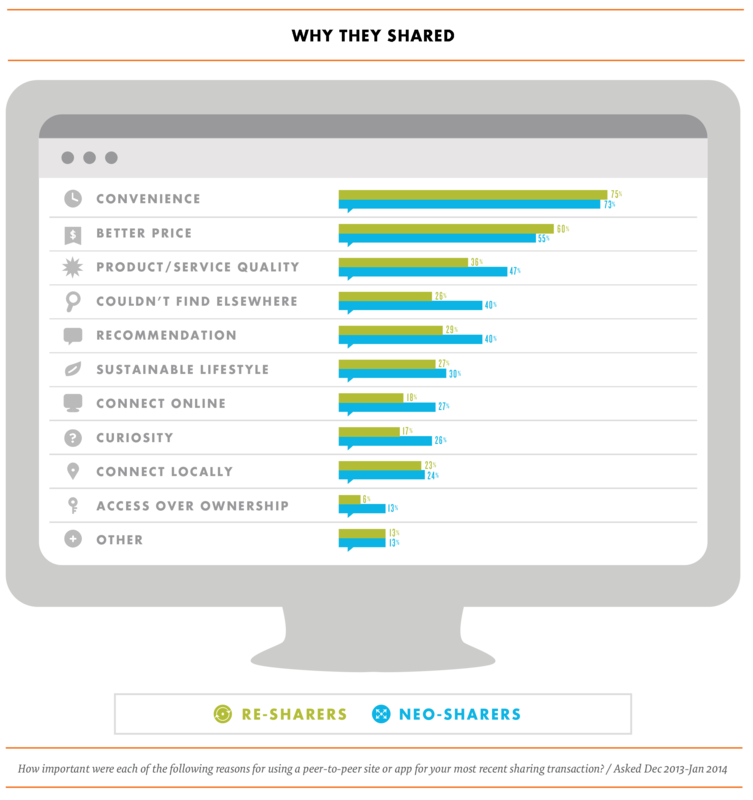 Sharers are driven by more immediate needs like convenience, value and quality. Therefore marketing should focus on benefits like the ease of access and the quality value of products. Stepping beyond new business strategies and initiatives, long-term success in the collaborative economy will demand full business model transformation. A pivot that will impact nearly every part of a company. Each business unit must learn and adapt it’s function as companies move into a collaborative economy where customers are collaborating on a wide range of business functions. Just consider how the collaborative economy could impact marketing. Sharing doesn’t merely introduce a new market segment, instead it offers an entirely new way to engage all customers. Customer engagement and digital strategy will be more than just a piece of marketing but rather a crucial piece of how companies develop and innovate their products. Businesses will move from iterative market research to ongoing customer engagement. Companies can prepare by identifying how current customers are participating in the collaborative economy and find out which products/services they would prefer access instead of ownership. Businesses can leverage digital channels and customer communities to engage customers in co-creation and pilot sharing initiatives. Educate stakeholders from every department in your company about the sharing movement and its potential impact on every aspect of your business including finance, product development, production and quality, marketing, supply chain, inventory control and legal. Create internal teams tasked with investigating sharing startups and identifying potential partnership, investment or acquisition opportunities. These are just a few examples. Preparing each specific business unit is vital for ensuring your entire company is successful in the collaborative economy. Major societal and technology shifts will accelerate these trends and patterns as young consumers and neo-sharers grow older and more mainstream, and mounting economic pressures and new business opportunities will intensify the search for innovative business models that can sustain in the new economy. Companies that fearfully drag their feet when faced with this opportunity, may find their core business at risk from a generation of sharing services that meet the real demands of today’s customer. Whereas business that fully embrace the collaborative economy and use sharing to leverage their existing assets and competencies in new ways will find unprecedented success. This entry was posted in Business Innovation and tagged business model innovation, collaborative economy, future of work, portfolio. Bookmark the permalink.